CINCINNATI -- Police officers trying to arrest a man ended up fatally shooting him and wounding one of their own after the man struggled and drew a realistic pellet gun. 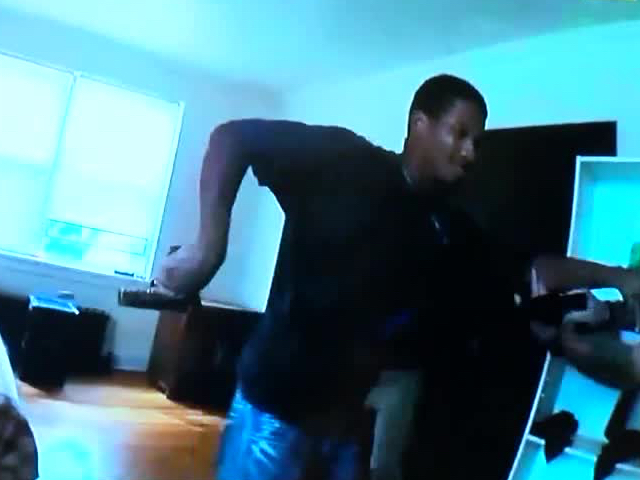 Police were serving a robbery warrant for 20-year-old James Clay in an apartment at 2630 Victory Parkway in East Walnut Hills at about 3:40 p.m. Friday, according to Police Chief Eliot Isaac. The officers knocked, but there was no response. Then an employee of Talbert House, which owns the building, helped the officers inside. They immediately encountered Clay, Isaac said. Clay refused to cooperate, and one of the officers threatened to use a Taser, Isaac said. He said Clay grabbed one officer's wrist. Police also played body camera video which appears to show Clay lunge toward a second officer and pull a gun from his rear waistband. The gun was actually a steel pellet gun, according to Isaac. But he said officers had no way of knowing that at the time. "These officers very much sensed their life in danger," Isaac said. Clay charged Officer Ronald Schultz, according to Isaac. Then, Officers Stephen Bender and Thomas Wells drew their guns and opened fire, killing Clay. Wells fired 11 shots and Bender shot five, according to Isaac. 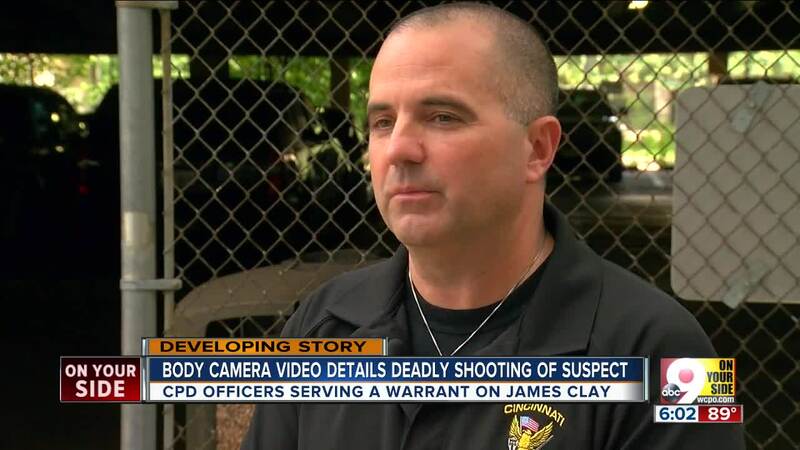 The body camera videos show Clay fall to the floor. One officer can be heard saying, "I'm shot, man. I'm shot." Officers drove the Schultz from the scene to University of Cincinnati Medical Center. He was shot in the forearm and also had a bullet graze his hand, police said. Those shots were fired by his fellow officers, according to Isaac. The officers involved will be on administrative leave for at least seven days per protocol, Isaac said. After the homicide investigation is complete, there will be an internal investigation and an investigation by the Citizen Complaint Authority. A police report described the incident as "justifiable homicide (Not a Crime)." Schultz has been with the Cincinnati Police Department since 2003, Isaac said. Bender has been with CPD since 2001 and Wells since 1995. 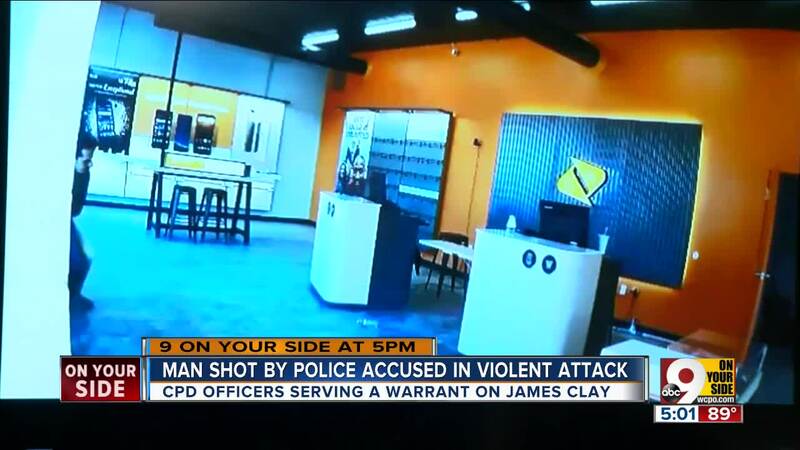 The warrant being served was for a robbery at the Boost Mobile store at 2536 Kemper Lane two days earlier. Police showed clips of security camera video of the incident. It shows a man, allegedly Clay, enter the store and begin an unprovoked attack on a 32-year-old employee. 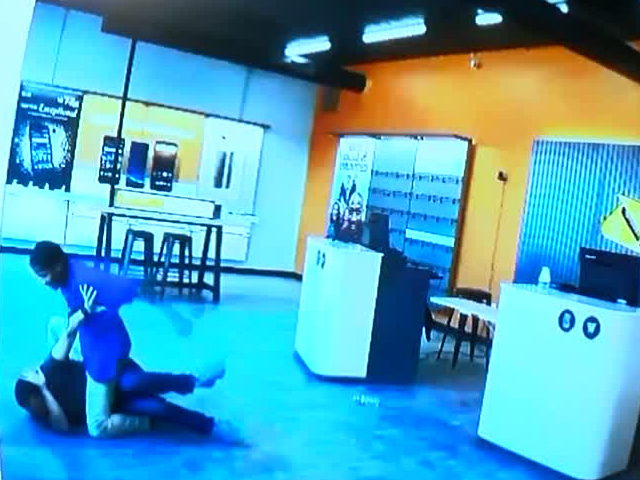 The man tackles the employee, punches him and slams him to the ground. Isaac said the attack lasted more than six minutes. The man then appears to take money from the desk and chases the employee out of the store. The attack left the employee with "serious physical harm and visible injuries," according to a police report. The robber made off with about $150. A detective investigating the robbery identified Clay as the suspect. The victim in that attack told WCPO Monday that he is still sore and his face is swollen, but he's healing. Isaac said Clay's family told him that Clay had a history of mental illness. Hamilton County court records indicate that Clay was sentenced to 90 days for resisting arrest last December. Police wrote that Clay ran from police after a robbery. He was held at Taser point, but refused to comply with the officers and attempted to run away again before officers caught him and arrested him. 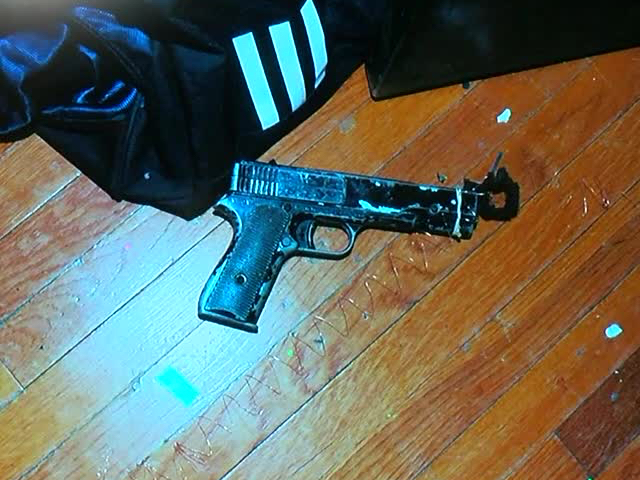 Saturday, Mayor John Cranley said the suspect was a known violent offender and had pulled a gun on officers when they arrived to serve the warrant. 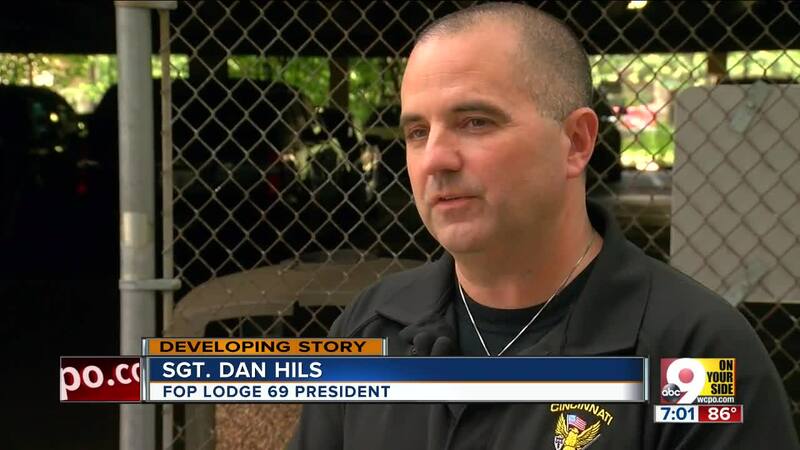 "Their actions were justified, and we pray for a speedy recovery," he said. According to Hamilton County property records and a Talbert House spokeswoman, the building in which the shooting took place is "permanent supportive housing" owned by the organization, which provides outpatient mental health and addiction treatment services to its clients. Cranley did not know what kind of treatment the suspect may have been receiving from Talbert House. Both Cranley and Hils said the incident brought to mind the shooting of Officer Sonny Kim , who died June 19, 2015, while responding to reports of a person "walking around (and) getting belligerent with a gun" in Madisonville. In reality, Kim had been deliberately lured to the scene by 21-year-old TrePierre Hummons, who shot and killed him before dying in a shootout with another officer. Like Kim, the officer wounded Friday was struck in a place his bulletproof vest did not protect. However, officials expected him to survive. "Thankfully, thanks to an outstanding job by this officer and other officers on the scene, I think we’re going to be OK," Hils said.